My name is Ricarda Saleh. 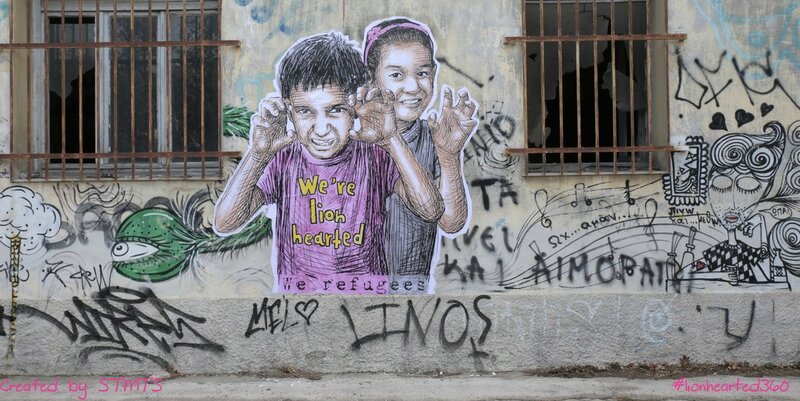 I am the Director of Lionhearted, which tells the story of a young girl named Rida who fled together with her family from Pakistan and is living in Athens, Greece seeking Asylum in Europe. In our 360° documentary the viewer can experience Rida´s world and immediate surroundings. Rida lives in the “best Hotel of Europe”. The Hotel City Plaza in Athens is a former 4**** Hotel build for the 2004 Olympics. It was an abandoned building for many years until in April 2016 a solidarity group occupied the Hotel to open a shelter for refugees. Now it is a self-organised home where refugees take responsibilities to run the shelter. Over 400 refugees live there including about 180 children. The street art piece above was created by the talented Athens based artist STMTS, who created this statement in his city. I would like to invite you to dive into our website and find out more about Hotel City Plaza, the current living conditions for refugees in Athens and 360° filmmaking/behind the scenes stories. On behalf of my team, I wish you an inspiring journey and would like to thank you for taking the time to get to know Ridas story! Drop us an email and we will keep you updated on the project development.